The property is reached via a tree-lined lane, opening into a large gravelled courtyard, which can easily accommodate 6 cars. The house and cottage have been sympathetically renovated, maintaining a wealth of original features with oak beams and vaulted ceilings, but has all the necessary facilities for convenient modern living, including fully automatic wood pellet heating, two shower rooms, full bathroom and a utility room. The property offers a great deal of potential for flexible family living. In addition to the house, with large master suite, there is a self-contained, 2 bedroomed apartment for, perhaps, older relatives or adult/teenage children. 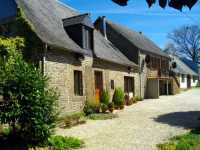 Otherwise, the fully renovated apartment has great income potential as a holiday gite, retreat or other small business. In addition to the house and apartment there is a stone and block built barn, which has permission to convert to a large family home, for your own expanding family or for the creation of an additional cottage with a view to increased revenue. Currently within the barn there is a fully insulated large games room/den which doubles as guest accommodation with its own WC and separate office space. The property, although wonderfully secluded, is located less than 5 minutes by car from the town of Gorron. This town has many shops and services including supermarket, banks, post office, independent shops, cafes, butchers, news agency, dentist, doctors and pharmacy. The large town of Mayenne is 20 minutes away and the larger Laval 50 minutes. Airports are within easy reach – Dinard (1 hour 40 mins); Rennes (1 hour) and Tours (2 hours 30 minutes). The closest ferry port is at Saint Malo (1 hour 40 mins); Caen (2 hours 15 mins); Cherbourg (2 hours 50 mins). The TGV train service can be taken from Laval to Paris Montparnasse. Kitchen/Dining Room 5.94 x 5.83m This light and airy room has a handmade kitchen including built-in fridge and oven and gas hob. There is a ceramic sink with mixer tap, tiled worktops and splash backs. There is an additional log-burning cooker/ heater. The large family dining area is panelled and there are beautiful, ancient exposed beams. There are views to both the front and rear gardens in this double aspect room. Utility Room 2.76 x 2.40m The fully tiled room, with double ceramic sink and plumbing for a washing machine also has lots of built-in storage, and additional work surfaces. Shower Room 2.71 x 2.59m This tiled and panelled room has a window to front elevation with WC, shower, vanity unit and extractor. This room also accommodates the pellet boiler for the full central heating. Lounge 5.94 x 3.51m This double aspect room, with views over the garden has wooden floors and exposed beams as well as a large, oak built-in storage cupboard. There is a central heating radiator and log burner. Landing Velux window to front elevation. Wood flooring. Built-in cupboards. Study Area Velux window to front elevation. Radiator. Wood flooring. Bathroom 2.54 x 1.94m With a sloping ceiling and exposed beams. Velux window to rear elevation. WC. Tiled floor. Radiator. Bath with mixer tap/shower fitment and tiled surround. Large vanity unit. Hatch to loft. Master Bedroom 4.59 x 4.1m This room, with its high cathedral ceiling and exposed ‘A’ frame beams is large and airy with double aspect windows. It easily accommodates a large bed and bedroom furniture with room for a seating area. It has two radiators. Dressing Room 1 Wood flooring, hanging and storage. Dressing Room 2 Wood flooring, hanging and storage. Hot water cylinder. External steps up to balcony with decorative gate and railings. Open Plan Lounge/Dining Room/Kitchen 8.62 x 3.26m 2 windows. Partly glazed door to front elevation and balcony. 2 radiators. Laminate flooring. Kitchen Area Space for upright fridge/freezer. 4 ring gas hob. Built-in oven. Stainless steel sinks with mixer tap. Island unit and matching base and wall units. Telephone socket. Built-in cupboard. Bedroom 1 3.20 x 2.78m Window to rear. Laminate flooring. Radiator. Bedroom 2 3.41 x 3.21m Window to rear. Laminate flooring. Radiator. Inner Hall Door to stairs to loft. Door to stairs to ground floor storage area. Shower Room 1.81 x 1.22m Shower. Hand basin. WC. Radiator. Hobby Room 2.61 x 1.00m Window to rear elevation. Barn with Planning Consent to convert into a large family home (15m x 6.92m) - Stone and block construction. Original solid timber roof beams. Within the barn there is an insulated games room/home cinema/den/spare bedroom with its own separate office, WC and storage cupboard. Oak-built Hangar 12.52 x 11.44m Parking for several vehicles, log storage area with doors to front and rear. Close to the house there are semi-formal gardens with herbaceous borders and lawn areas. There is a dedicated vegetable garden with a large glass greenhouse. To the front, there is a herb and aromatics garden, a Jane Austenesque shrubbery, poultry runs and houses and a reedy natural pond. To the back, there is a copse of mainly native trees and American oaks (for log burner when thinned), a meadow garden, two grassed picnic/play areas and large composting bays. There are lots of fruit trees including apple, pear, plum, cherry and damson and also soft fruits including strawberry, gooseberry, goji berry and raspberry. There are natural blackberries and hazel nuts, chestnuts and walnuts. It’s a beautiful, productive garden, full of bird song! Oak-built Barn divided into four separate areas, this barn is located at the rear of the building. Mains electricity and telephone are connected. Well water. Drainage is to an all water septic tank. Broadband internet connection. Fully automatic and programmable pellet central heating in the main house, with additional log burner in the lounge. Gas fired central heating in the apartment. Double glazed wood framed windows. Please note : Whilst the Energy Report has been carried out there is no rating for this property.